Pete Sweeney, Mike Wickett and Shawn Barber provide analysis and take calls after the Chiefs 42-37 win over the Pittsburgh Steelers. Head down to the Laboratory with the Arrowhead Pride Nerd Squad, as Kent, Craig and Matt discuss all that transpired in the Chiefs' big win over the Los Angeles Chargers! The Kansas City Chiefs defeated the Los Angeles Chargers in the first game of the NFL season. Arrowhead Pride takes calls from Chiefs fans, provides analysis and discussess what it all means. The Chiefs play the Chargers in the first game of the 2018 season. 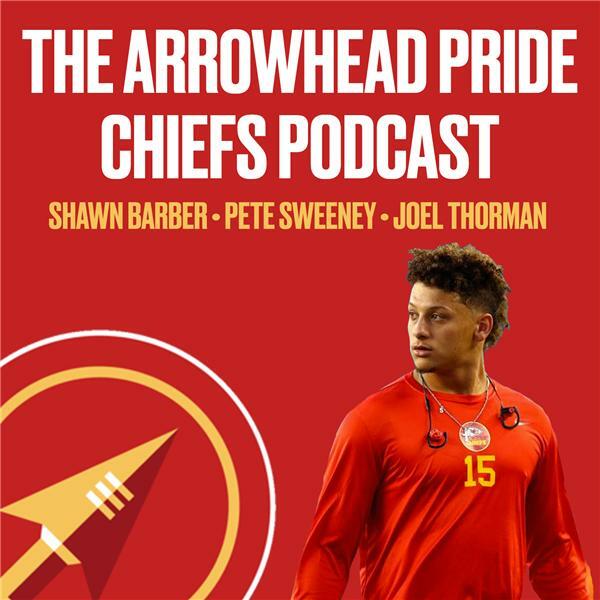 Arrowhead Pride editor-in-chief Pete Sweeney, lead draft and film analyst Kent Swanson and co-host Mike Wickett wrap up and analyze the Chiefs' final preseason game of 2018, a 33-21 win over the Green Bay Packers. Arrowhead Pride editor-in-chief Pete Sweeney, lead draft and film analyst Kent Swanson and co-host Mike Wickett wrap up and analyze the Chiefs' third game preseason game of 2018, a 27-20 loss to the Chicago Bears. Arrowhead Pride editor-in-chief Pete Sweeney, lead draft and film analyst Kent Swanson and co-host Mike Wickett wrap up and analyze the Chiefs' second game preseason game of 2018, a 28-14 win over the Falcons. Arrowhead Pride editor-in-chief Pete Sweeney, lead draft and film analyst Kent Swanson and co-host Mike Wickett wrap up and analyze the Chiefs' first preseason game of 2018, a 17-10 loss to the Texans.